As human cities have grown, some wildlife species have figured out how to take advantage of these new habitats. A big plus of city living is the steady stream of easily available, highly calorific, and tasty food – that is, our leftovers. But what happens when animals start to eat like modern humans? In the case of raccoons, the answer appears to be that they become absolute units. In a study that appears in the August 2018 issue of Conservation Physiology, Canadian researchers weighed and took blood samples from a total of 60 raccoons living in three different areas with varying access to human food . They found that raccoons living on the grounds of the Toronto Zoo – trash panda paradise, with all sorts of tossed-away treats – weigh more and have higher blood sugar than raccoons living in urban parks with moderate access to human food or a rural setting with low access to human food. The results suggest that the diet that makes us humans fat also makes raccoons fat. However, future research will need to establish more directly whether raccoons with more access to human food actually eat more of it, and whether heavier raccoons have more body fat. The researchers say that more studies are also needed to determine the evolutionary consequences of these findings. Are raccoons with high blood sugar less likely to survive and reproduce, or more vulnerable to disease? Or are urban raccoons adapting to a junk food diet somehow? Relatively few studies have investigated the evolutionary consequences for wildlife species of eating human food. Last year, researchers reported that urban white-footed mice have genetic variations associated with metabolism of carbohydrates and lipids that may indicate adaptations for eating our leftovers . A study published 8 August in Proceedings of the Royal Society B suggests something even more dramatic: dietary shifts and the consequent genetic changes may contribute to the emergence of new species. In this study, an international group of researchers sequenced the genomes of 46 house sparrows and 19 Bactrianus sparrows . House sparrows are native to Western and Central Eurasia, but have spread to virtually all inhabited areas of the globe. They live in cities and farmland, and feed on food waste and crops. They are so thoroughly dependent on humans that when people abandon a settlement, house sparrows disappear from the area too. The Bactrianus sparrow is a house sparrow subspecies that lives in the Middle East and Central Asia, but is not associated with human settlements. It is wary of people and, unlike the house sparrow, migrates. Ornithologists believe the Bactrianus sparrow represents a relict lineage with ancestral characteristics from before the house sparrow became adapted to living alongside humans. A comparison of the Bactrianus and house sparrow genomes supports the view that the two lineages split 11,000 years ago, around the time agriculture emerged in the Near East. It also suggests that the house sparrow population expanded dramatically about 6,000 years ago. “Commensal house sparrows therefore likely moved into Europe with the spread of agriculture,” the researchers write. The comparison also identified several genome regions that appear to be involved in the house sparrow’s adaptation to the human niche. The strongest of these regions contains a gene, COL11A, that is involved in skull and facial development. This could help explain how the house sparrow developed a more robust skull and beak compared to the Bactrianus sparrow – an adaptation for eating crop seeds, rather than the softer seeds of wild grasses. Another gene in the region is AMY2A, which encodes an enzyme involved in digesting starch. Other research has shown that changes in this gene went along with adaptation to high-starch diets in both humans and dogs. “Our findings therefore add to the emerging picture that the Neolithic revolution introduced a common selective pressure that has resulted in parallel adaptations in similar genes for three very different taxa—humans, dogs and potentially, house sparrows,” the researchers write. That’s more evidence that when we talk about urban dwellers, we’re really talking about a taxonomically diverse menagerie, with a lot of physiological and genetic commonalities across species. Schulte-Hostedde A.I. et al. “Enhanced access to anthropogenic food waste is related to hyperglycemia in raccoons (Procyon lotor).” Conservation Physiology. 2018. 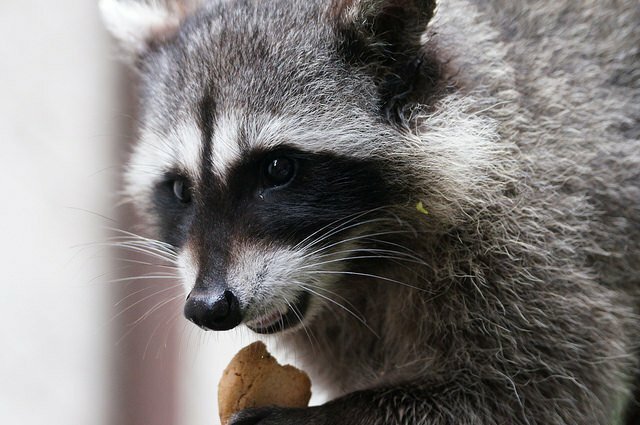 Image: A raccoon named Rocket eating a cookie. Credit: Tjflex2 via Flickr.